View More In Shade Sail Hardware. Install your trigangle shade sail anywhere you would like with these hardware kit,tree wall or pole. and it's very simple to use, you can easily complete the installation yourself. High quality 304 stainless steel having a excellent anti-rust characteristic, it special for outdoor using such as patio, lawn or garden. High load-bearing capacity which it can keep your sun shade sail stable in wind. Fulfilled and shipped by Amazon, fast delivery and accessible return/refund service. Hardware kit for triangle sun shade sails installation or car shed installation. prevent your shade sails from being blown away or shaken violently. 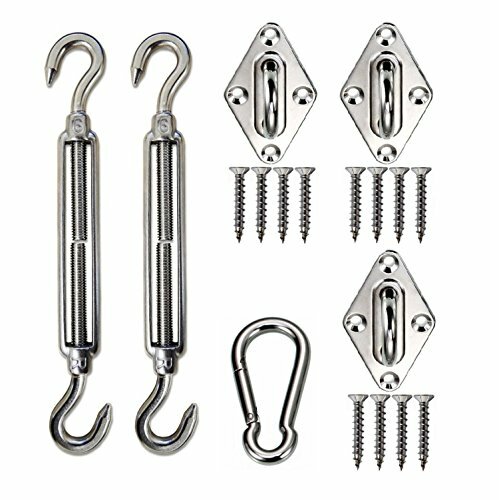 Triangle Hardware Kit Includes: Turnbuckle x 2pcs, Pad eye x 3pcs, snap hook x 1pc, screw x 12pcs.The length of the turnbuckle can be adjusted from 6 inches to 8.5 inches which make your shade sail tight so that it will be more stable. Made from high quality stainless steel, having excellent anti-rust characteristic, it special for outdoor using such as patio, lawn or garden. it's very simple to use, you can easily complete the installation yourself. If you have any questions about this product by Kuality, contact us by completing and submitting the form below. If you are looking for a specif part number, please include it with your message.